HWASEONG, Gyeonggi Province – Though many don’t realize it, South Korea’s most populous province has long relied on Japanese seeds for rice production. As of last year, Akibare and Koshihikari crop seeds from Japan grew on some 80 percent of 784.8 square kilometers of rice paddies in Gyeonggi Province, which surrounds the capital and is home to some 330,000 farmers. Confronting the need to curb reliance on Japan and cultivate seeds most suitable for Korean soil, the Gyeonggi Province Agricultural Research and Extension Services, an agency under the Gyeonggi Provincial Government, created homegrown rice seeds. The seeds, dubbed “Mat Dream” and “Cham Dream,” are the results of decades of work by GPARES. “The government-led plans to develop rice seeds since 1970s had fallen short of developing crop seeds most suitable for the land in Gyeonggi Province,” Kim Soon-jae, director-general of the agency, told reporters, recalling the days when late President Park Chung-hee developed seeds called “Tongil,” which contributed to the nation’s self-sufficiency. More than a decade ago, Kim took part in developing Mat Dream and Cham Dream by hybridizing homegrown seeds. Created in 2001, Mat Dream underwent tests for crop yield and soil adaptation from 2008 to 2011, while Cham Dream, developed in 2004, went through six years of tests until 2014. Commercialized in 2015, the medium-maturing Mat Dream -- designed to replace Koshihikari -- is a grain seed suitable for climates north of the Han River. The following year, the agency showcased the medium-late-maturing grain Cham Dream -- a substitute for Akibare -- optimized for growth in the south of the Han River. In Gyeonggi Province, rice is grown on humid soil, mostly categorized as either Alfisol or Ultisol. Alfisol refers to clay-enriched soil containing minerals such as aluminum and iron. Ultisol, also known as red clay soil, refers to soil with less than 10 percent weatherable minerals. Despite its humidity, Ultisol’s relatively high acidity requires farmers to use fertilizers. Both Mat Dream and Cham Dream outperformed Japanese seeds in yield, according to the agency. Mat Dream seeds yielded 6 percent more than Koshihikari, while Cham Dream produced 13 percent more rice than Akibare. 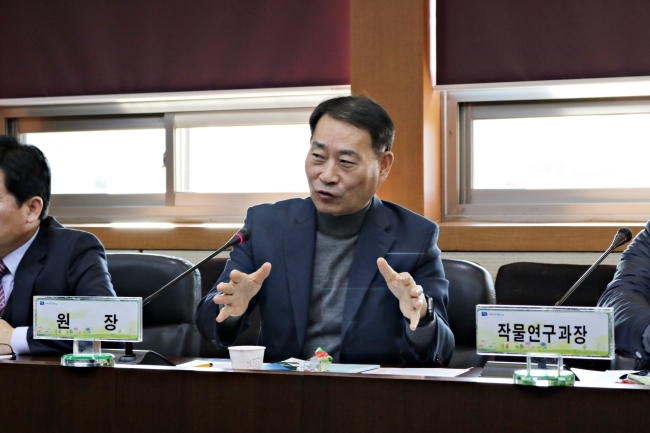 The seeds’ enhanced productivity could help farmers secure higher income, said the 59-year-old Kim, who has been in charge of developing, promoting and marketing agricultural and horticultural products for farmers in Gyeonggi Province since taking office in July 2016. This year, Gyeonggi Province harvested Mat Dream rice from 22.3 square kilometers of paddies, while Cham Dream rice grew on 22.8 square kilometers. When combined, they took up nearly 6 percent of all rice seed production in the province. The rest of the seeds -- other than Japanese seeds and GPARES’ seeds -- are supplied by the Agriculture Ministry-affiliated Rural Development Administration. Kim expects the size of paddies that use Mat Dream and Cham Dream seeds to double next year. However, GPARES is facing an unanticipated challenge in the wake of the recent oversupply of rice across the nation. To avoid grain price fluctuations, the Korean government unveiled plans in July to carry out the third round of rice supply control for the next two years, mainly by inducing farmers to cut rice production on some 1,000 square kilometers of paddy fields, using government subsidies. Furthermore, the high productivity of Mat Dream and Cham Dream left farmers’ co-op Nonghyup hesitant to purchase them, and even prevented Cham Dream from being certified by the Rural Development Administration. To curb oversupply, the RDA has set the upper cap of crop yield at 570 kilograms on 1,000 square meters of paddy field. However, Cham Dream yields over 590 kilograms on 1,000 square meters. 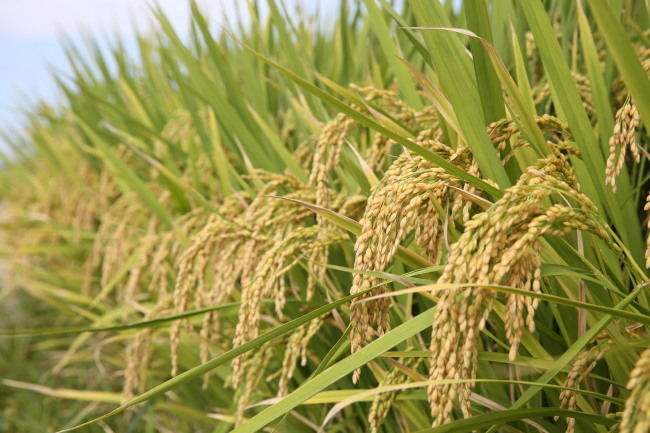 The agency has been in talks with a number of rice-growing towns in Gyeonggi Province, such as Paju, Goyang and Anseong, to designate them as a special zone to grow the two new rice seeds. Kim said the towns appear willing to substitute Akibare seeds with the homegrown ones. Moreover, the government’s plan to curb rice production is not carved in stone, Kim said, as no one can predict a shortfall in rice due to the monsoon or typhoons. “Through the seeds, Gyeonggi Province will be ready to cope with any possible rice shortage,” Kim said.